Color: Silver. Material: Galvanized Steel. Length: 4 ft. 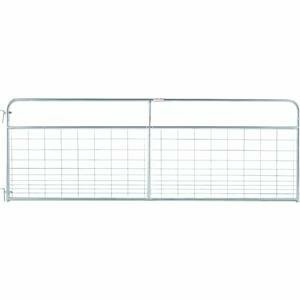 Designed for confinement of hogs, sheep, or any small animal. 1-3/4 in. round high-tensile strength tubing. Ready to hang with hinge pins, snap chain and welded chain latch. Available sizes from 4 ft. - 16 ft. (4-20 ft. in the East Region). If you have any questions about this product by Tarter, contact us by completing and submitting the form below. If you are looking for a specif part number, please include it with your message.